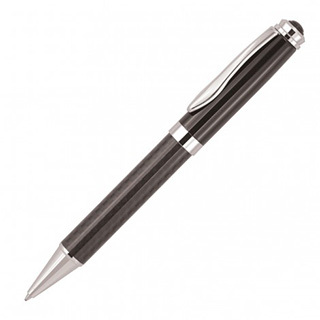 The Andre Metal Carbon Fibre Ballpoint Pen has a substantial metal barrel with a unique and classy carbon fibre design with chrome trim. This quality twist action, retractable ballpoint would make a stylish corporate gift engraved with a gold finish and/or printed with your promotional logo on the cap. Quality black ink from a Parker type refill with a 1.0mm nib. Executive class.